“The Maserati 3015 – Complete History” is telling the most unusual story of a Grand Prix car from 1933 to the present day, enriched by never seen period photos. The author executed a painstaking research into the political and economic circumstances unveiling the fate of this very car from the day of delivery, its races, its drivers and its owners into the postwar era of the fifties when the proud Italian was still victorious in the communist Hungary. A period when most of the mighty thirties rivals were either scraped or hidden at remote places or in museums. At present the Maserati 3015 has been fully restored, revealing his period Hungarian racing colors. 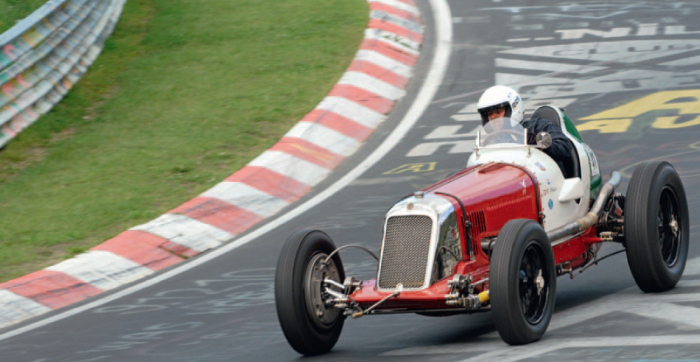 The present owner does not hesitate to race the Nordschleife of the Nürburgring at speed, the famous track where 1937 Ernö Festetics achieved his best international success. From his early days Bernhard Brägger has been involved with historic motorsport. He was an active rallye driver, sports commissioner for the Automobile Club of Switzerland and general organizer of the Klausen HilclimbMemorials as well as other historic car meetings. He is well known as author of fascinating books like “Kompressoren am Berg”, “Mythos Klausen” or “Die Geschichte der Rallye Monte Carlo”. His involvement with automobile history and especially the pre war era initiated this book, written in his incomparable words.